The Argonne team went on to win two additional grants totaling $1.4 million from the U.S. Department of Energy, but it was through the initial LDRD funding that they recognized graphene as an emerging solid lubricant, one that works differently than existing oil-based and other solid lubricants, including graphite lube and even diamond-like carbon. Not only does graphene perform better, it’s more affordable. Even moderate quality graphene works great for tribological applications, which is not the case for various electronics and sensor applications. Most of the cost in conventional solid lubricant coatings relates to the infrastructure needed to apply it, including the electricity to run the related machinery and the machines’ maintenance. 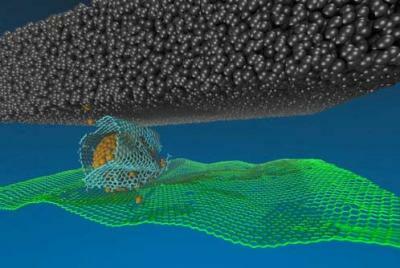 Not so with graphene, which can be applied by spraying a solution in the air and can coat any complicated shape or size — and over a large surface area. In an effort to bring their finding to the marketplace, the research team is currently working with two different companies in vastly different industries. The first is one of the world's leading providers of mechanical pump seals. It is working with the scientists to replace its silicon carbide seals with graphene, which would reduce wear and friction. The team also plans to work with another company from the automobile sector, which uses molds to create car parts, including door panels. Argonne researchers are seeking to develop a new lubricant that could reduce friction in metal forming applications and thereby bring down the cost of automobile manufacturing.